In my last coffee related post, the aim of choosing the three particular bean varieties was to specifically create a blend that worked equally well in most, if not all forms of brewing that I use, both short and long, as well as espresso based milk drinks. Although the destination I am trying to reach in a blend is probably one I will never fully attain, improving with each attempt will be satisfying enough for me. As my drinking methods involve many styles, creating a blend to suit them all is not likely to be an easy one. All things considered, the current blend worked out quite well. 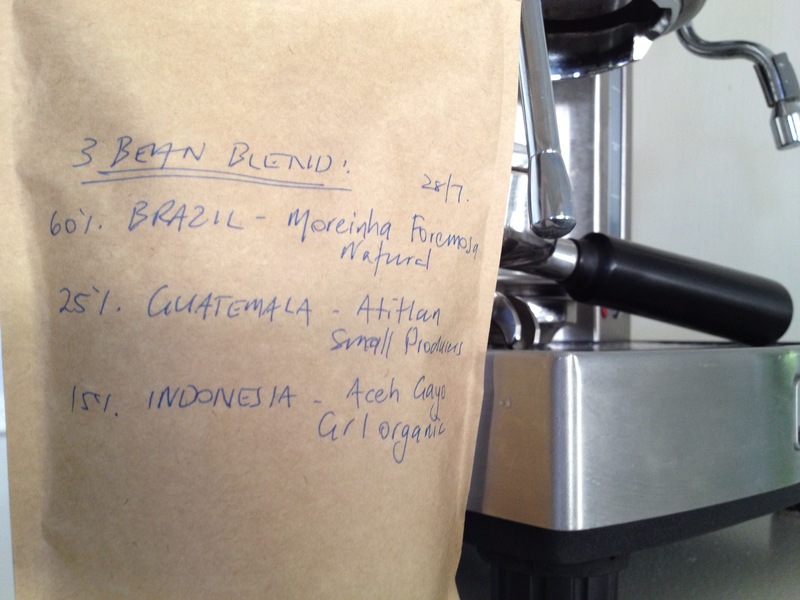 What – Three bean blend (60% Brazilian, 25% Guatemalan, 15% Indonesian). All roasted on the lighter side, with the Brazilian light to medium. Assessment – Dry Aroma – Probably best described as caramel and nutty, with hints of brown sugar and a little fruit. Latte – Mild caramel flavour with traces of fruit; has a lengthy finish as the body of the Brazilian pushes through. The extra body certainly made this work well in a milk based drink, without overpowering the creaminess and fruit tones of the Indonesian and Guatemalan varieties. Aeropress – When brewed in the Aeropress, notable body was evident, with a crisp fruity sweetness, again with a nice long finish. Some of the herby / floral traces from the Indonesian also shone through. Espresso – The more concentrated form of an espresso brought out the creamy caramel and brown sugar flavours of the blend. There was still a good amount of acidity, and crisp sweetness remaining, however the floral tones of the Indonesian were lost. Conclusion; Know This – Overall I was quite happy with this blend, which worked particularly well as the base for a milk drink, yet also short or long on its own. What would I change? Probably a little more body for the milk drink, and a little more of the fruitiness for all forms of brewing. That will be for the next blend! Time for an iOS app spring clean?